RALLY IN THE WIND AND RAIN. 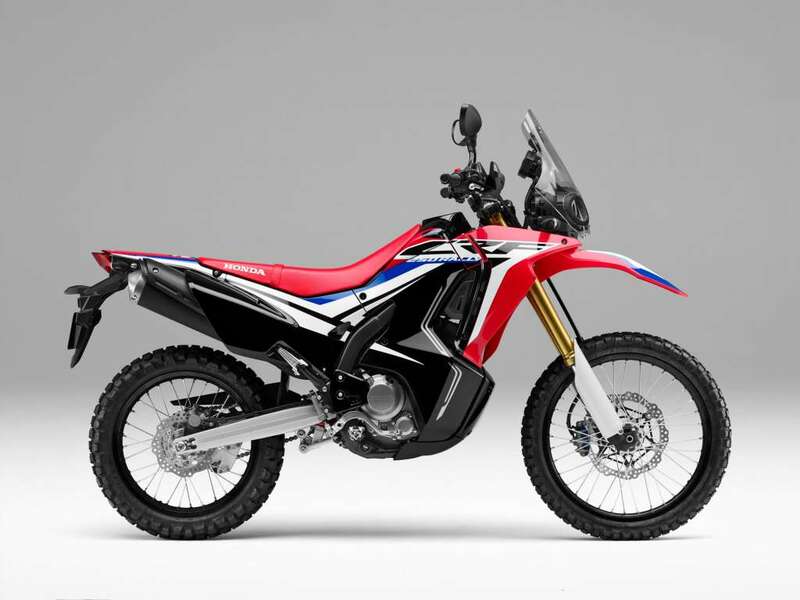 Honda’s 250cc class dual-sport is more than ready to take on exciting off-road challenges without giving up street-riding accommodations. The compact and sophisticated liquid-cooled DOHC 249cc single-cylinder four-stroke powerplant produces smooth and consistent torque at low rpm to aid off-road work, yet the short-stroke engine also spins up excellent high-rpm performance for the street. All through the rev range, the CRF250L pumps out a well-balanced and very capable level of power with good throttle response. Its off-road-oriented chassis, which includes a long-travel 43mm inverted fork and single-shock Pro-Link® rear suspension, makes the bike equally at home on city streets or country trails. 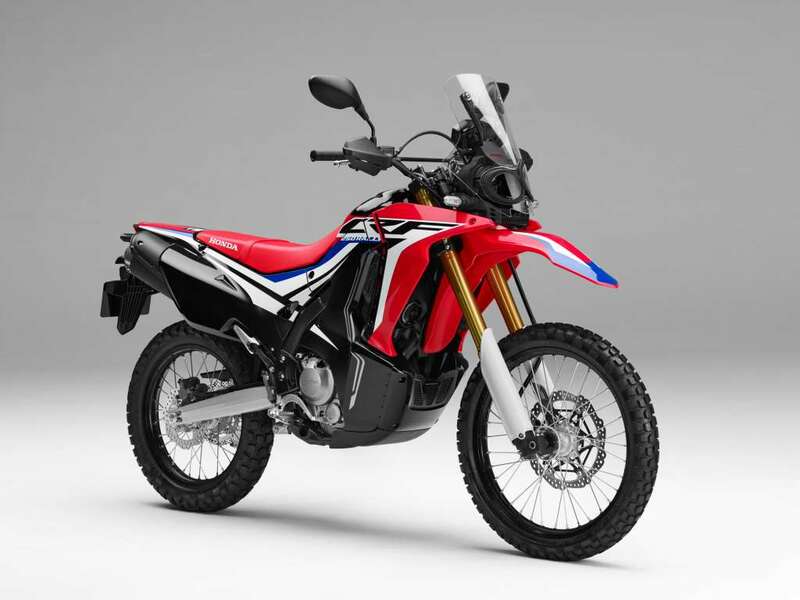 And with styling cues carried over from Honda’s incredible CRF450R motocross bike, the CRF250L offers the full package, whether the day calls for low-cost transportation, a weekday commute or genuine dual-sport adventure. 249.6cc single-cylinder four-stroke engine returns excellent fuel economy and features a broad powerband with plenty of low-revving torque. Fuel injection means the CRF250L models start right up, even in cold weather. Large, 38mm throttle body offers ideal response and power in low and midranges. Inverted Showa fork features large 43mm sliders for excellent handling in on or off-road conditions. Front and rear hydraulic discs for excellent stopping power and brake feel, both for on-road and off-road use. Available Anti-lock Braking System (ABS) allows smooth, controlled stops in varying conditions. The CRF250L’s digital instrument cluster is integrated with the headlight visor, and gives you all the information you need: Speedometer, clock, twin tripmeter, fuel gauge, and more. The CRF250L Rally’s digital instrument cluster tucks in behind the rally-style windscreen, just like the big Dakar bikes. The tall windscreen, the extra-coverage fairing and side panels, the blended, frame-mounted bodywork are all marks of a true rally machine. The 2019 CRF250L Rally looks great, but you’ll appreciate the extra wind- and weather protection too. An inverted Showa fork features large 43mm sliders. That makes it strong and helps add to the CRF250L model’s excellent handling in on or off-road conditions. The CRF250L models feature front and rear hydraulic discs for excellent stopping power and brake feel, both for on-road and off-road use. Both bikes are even available with optional anti-lock brakes (ABS), which you can de-select for dirt riding. Fuel injection means the CRF250L models start right up, even in cold weather. Compared to a carbureted bike, it also helps reduce emissions and enhance performance and fuel efficiency. A single is the perfect choice for a bike like the CRF250L and CRF250L Rally. It’s light, simple, returns excellent fuel economy, and features a broad powerband with plenty of low-revving torque—just what you want in this type of a motorcycle. Because it features a counterbalancer, the engine is a smooth runner. You get the narrow overall width and power advantages of a single along with the smoothness of a multi-cylinder bike. Thanks to our single-shock Pro-Link rear suspension, the CRF250L models deliver excellent comfort, traction and handling, while also improving rider confidence. The Rally’s suspension front and rear offers more travel and greater ground clearance. With its long seat and fold-up frame-mounted passenger footpegs, each CRF250L model is fully equipped to carry a passenger so you can share the fun. Special cargo hooks make it easy to secure a light load to the passenger seat with bungee cords. It’s just another one of the nice touches that help make these bikes so versatile. It also has a storage box on the left side for small items you need to keep secure. A 21-inch front and 18-inch rear wheel give you a wide selection of tire choices for everything from serious off-road trail riding to smooth on-road adventures.